Thanksgiving is seriously right around the corner guys! Can you believe it?? Although I am extremely happy about the upcoming holidays, I'm also in utter shock at how quickly things are moving. Phew! I wish our weather would get the hint. Although the calendar says it's November and the autumn season (read: almost December and WINTER) here in southern California it's been in the upper 70's and on a few occasions in the 80's! THE 80's! I mean, that's like...uber unacceptable weather! I have all these fun boots and scarves and LONG SLEEVES I would like to wear. Not shorts and sweaty under armed shirts! I'm done sitting at my desk working away, only to continuously sweat and stick to my chair. Hey-o! There was a tiny break in the warm weather a little bit ago. We celebrated by lighting candles, drinking warm tea at night, and cooking dinner with the oven :) As opposed to salads and stove-top cooking, which I'm all too ready to give up this time of year. Bring on all the oven baked comfort foods! Late one night, while I was trying to snooze away I had this idea for a "stuffed" baked squash. I love stuffed foods (squashes, meats, bell peppers) but find myself sort of limited to carbohydrate and ground meat fillings. Don't get me wrong, nothing is at all bad about that...but I wanted to do something a little different- push the envelope a bit. Then I thought about eggs! Why not create a delicious custard like quiche filling (I also love quiches) and bake that into a autumnal acorn squash?? This eliminates the heavy carb filling, but still gives us the protein we need! So the next day I tried it out! I spent the day concocting a yummy (and very flavorful) egg custard filling and baked it slowly until set, in a par-baked fresh acorn squash. Where has this been all my life? I mean...really? It was the neatest thing! Totally filling for one. I mean, one whole squash and 2 little eggs will totally feed 2. The ingredients were so simple- this dish uses things we ALL have (or can easily get). Easy to fill and less messy than the other stuffed dishes! Sometimes my rice/quinoa/meat stuffed veggies end up spilling out and making giant messes. Not this! It sits wonderfully inside the acorn squash center and bakes just perfectly! Plus, with Thanksgiving coming up, this is a perfect vegetarian or gluten free side or main dish while the rest of your guests dig into that turkey! 1. Preheat oven to 375°F. Cut washed squash in half length-wise and scoop out all of it's seeds. On the rounded "bottom", cut off a small amount so that the halves will sit flat and level, cut side up. 2. In a baking dish place squash, cut side down (so middle of squash is facing down), and fill dish with enough water to come up sides of squash 1/8-1/4". Loosely cover pan with tin foil and par-bake for 25 minutes. 3. Remove squash from oven and allow to cool 5 minutes and turn oven up to 400°F. After 5 minutes, carefully remove squash halves from dish, pour out almost all of the water (you'll want just the tiniest thin layer left on the bottom), and place squash back into pan- this time, cut side facing up! Sprinkle half of the sea salt and half of the pepper on the meat of the squash, reserving the remaining half for your quiche filling. Set aside. 4. In a separate bowl, whisk together your eggs and milk until thoroughly combined. Then whisk in the remaining half of your salt and pepper, as well as your chives. 5. Place half of your diced tomato into one squash's center and the other half into the other squash. Carefully pour egg mixture into the centers of each squash, filling up until it just comes to the top. Be careful, you'll have to move pan into oven, so you don't want custard to spill over. 6. Cover dish loosely again with tin foil and bake for another 25-35 minutes. You're looking for the eggs to have set (not jiggly) and the squash meat to be cooked through. 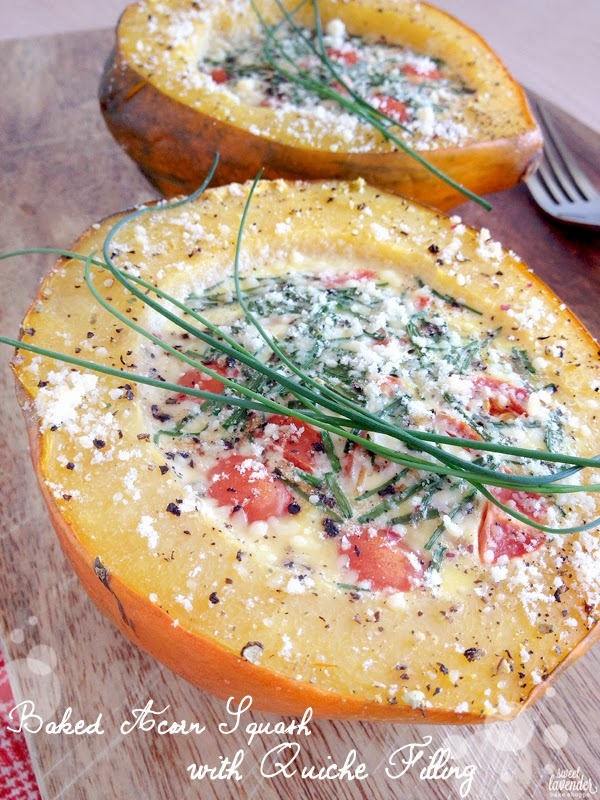 5 minutes before squash is done, remove from oven, and sprinkle tops with your parmesan cheese. Then, bake for the remaining 5 minutes uncovered. 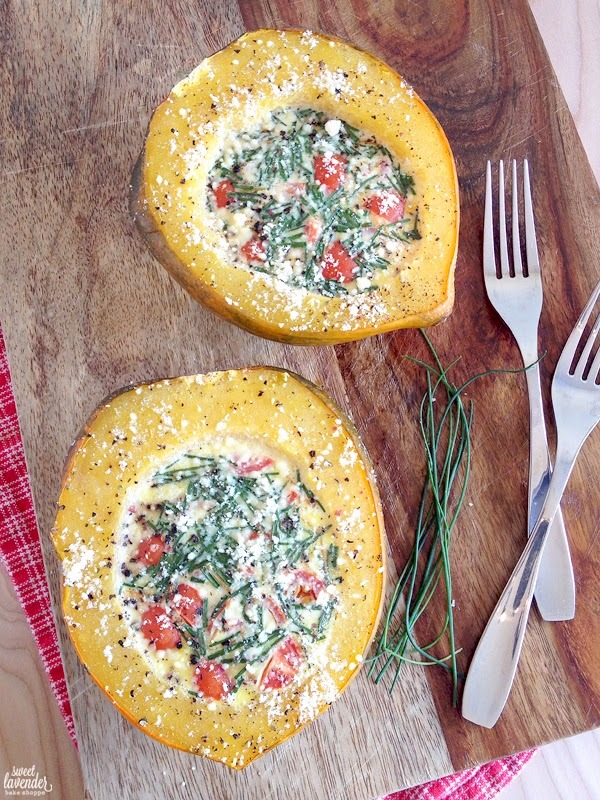 Squash can be par-baked up to two days in advance! Just cool completely and then store in fridge in an air tight container until the day needed. Fill centers with the quiche filling day of, and bake accordingly. I can't wait to make this again! That is...as soon as it cools down. Blarg. Wow, this sounds amazing. I love squash but sometimes it can get a bit run-of-the-mill. I'm going to try this recipe for Thanksgiving... it looks and sounds delicious! So glad! Hope it makes your mouth happy! Well…goodness gracious! That looks AWESOME!Readers can get more on diet tips online.